Snippets of Jack: "...And I'm gonna take it." "...And I'm gonna take it." Ahhh back to the beginning. Jack Sparrow is searching for his ship The Black Pearl. But first he has to wake up his old pal Joshamee Gibbs. Who like any other pirate on his day off is drunk and passed out with a bunch of pigs. Sounds like fun ehh? Wide awake after a quick dousing Gibbs is wondering what Jack is doing waking up an old pirate like him. "I'm going after 'The Black Pearl'...I know where it's going to be, and I'm gonna take it. ""Jack, it's a fool's errand. You know better than me the tales of the Black Pearl." "That's why I know what Barbossa is up to. All I need is a crew." "From what I hear tell of Captain Barbossa, he's not a man to suffer fools, nor strike a bargain with one." "Well, then I'd say it's a very good thing I'm not a fool, then, eh?" Well that sounds like a great plan Jack! Except he has no crew. but he does have a nice big boat curtsey of the British Navy. You all remember that story of course he and will stormed on board and commandeered the ship no harm no foul right? Wrong. Norrington was quite upset at the loss of his ship and sets sail after them to reclaim it. Hmm quite a lot of borrowing without asking going on if you ask me. Anyways Jack hires his crew of swashbukling pirates thanks to the help of Gibbs:"I'll find us a crew. There's bound to be some sailors on this rock, crazy as you. ""One can only hope. Take what you can! ""Give nothin' back!" and they set sail on a great adventure to find and hopefully defeat Hector Barbossa and reclaim Jack's ship 'The Black Pearl'. They catch up with good old Barbossa after a while, Jack confronts his mortal enemy and jerks his tail around with rude little jokes about; apples...? Apples, really Jack you sounds SO threatening. 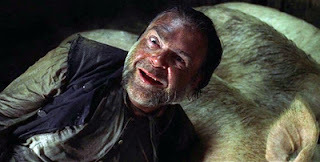 NOT, but Jack knows something the rest of his crew does not; Hector Barbossa hasn't tasted an apple in years and instantly grows tired of Jack's insolence and refuses to turn over the ship. Jack gets thrown off the ship and the rest of crew is held captive by Barbossa. Well you just had to bring up the apples didn't you Jack? After being marrooned on a familiar island with Elizabeth Swann for a while she goes crazy and burns all the rum in hopes of being found be her fiance the great James Norrington, who just happens to be in the area anyways looking for Jack and gives them a lift back to the middle of the ocean, Where Jack Convinces him to go after the pirates who kidnapped his gorgeous bride-to-be Elizabeth, all the while planning his revenge on the man who stole his pride and joy away from him: Hector Barbossa. Norrington being love struck and foolish listens to Jack and sets sail for Isla de Muerta. But his opponents are far more menacing then he thinks. Norrington splits up his men and takes some with him while leaving some on board his vessel. His men fight valiantly in battle but were losing quite badly by the time Jack intervened unknowingly saving Norrington's life and many lives of other British naval officers. But how might you ask did he accomplish this act of heroism. Well he had his newest friend Will Turner cut open his hand. Ending the curse that was placed on Barbossa and his crew man years ago. And just as Barbosssa thinks he has won Jack shoots him in the heart and denies him the pleasure of finishing his first apple in years. Jack however isn't done yet, he gets recaptured by the British Navy and is all set to be hung the public arena (which just happens to be on a balcony quite close to the ocean) but his crew saves the day and Jack narrowly escapes the gallows. 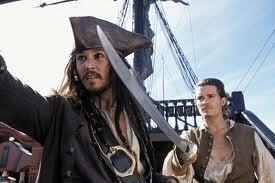 But of course he would have even without the help of his friends (well maybe) because he is Captain Jack Sparrow, Savvy?